Trustee Russell Ball explains why he undertook a 1,500 mile solo bike ride from Gibraltar to London. Why this ride? Since hearing about this challenging route in my local cycle shop and biking the UK twice it seemed an ideal way of raising the bar. Moreover, there was a logical link between the botanic gardens of Alameda in Gibraltar and Kew in London. With sponsorship secured from Eezytreev and Gristwood & Toms the plan was set for a solo unsupported Fund4Trees (F4T) ride. One month out from the ride around 600 miles training were put in to stress-test the legs. And so the day came. Bike serviced and boxed-up for the Gatwick flight. No turning back now. Sight of the infamous huge vertical “Rock” on landing in Gibraltar was impressive. Pondered just have to bike that? On ride-eve stayed with Jon Hammerton (Alameda Gardens: General Manager) and family. I’d known Jon from his heady days at Kew and was impressed that he’d organised the garden’s director Dr K. Bensusan, the Hon. John Cortes Gibraltar Environmental MP and even the TV to attend the first tree planting. And of course not forgetting – I biked the 400m high “Rock”. A short-sharp climb so steep that the bike front wheel bounced off the ground as I pedal-pumped to the top. Views were fantastic though with Morocco a short distance away on the horizon. The TV filmed ash tree planting was a success with the Notre Dame school ending with the F4T “Grow-tree-Grow” chant. Time for a quick shopping trip (see Kew later) then exit for ride day-one with thoughts of “am I really doing this” crossing on my mind. Gibraltar to Madrid. A flat coastal road lead towards Málaga (birthplace of Picasso) overlooking the blue Mediterranean with the warm salty air filling my nostrils. Felt like being on holiday but I knew this was going to be a real test of determination and self-belief. A steady 80 miles and all systems good. Day two was a complete contrast climbing up into El Puerto de las Pedrizas though a dusty-red landscape peppered with olive trees. A 780m climb of over four hours with close quarter lorries thundering by. Next day leaving Malaga was nearly game-changer as bikes are not permitted on some of the A-road and had to use the parallel E-902. This decades old – virtually unused – route is now a dirt-track at best with loose gravel, rocks and steep craggy ascents and descents. Just not suitable for my hybrid road bike. A one point in pouring rain thought crossing Spain like this was not do-able. Thankfully afters many hours the track led to an asphalt road: heaven! And arrived in Jaen (worlds capital for olive oil) like an exhausted drowned rat! Next day started well but then the asphalt road ran-out: back to the dismal E-902. After a quick petrol-station divert was advised to leave this track and head for Santa Elena on the edge of the Despeñaperros national park. This was reached by a steady winding climb through a dense cork oak and pine forest, with nobody for miles. Perfect. One of many steep snaking descents followed next day with a spectacular climb up into this UNESCO national park. Near the top had a close-quarters wildlife encounter. A large female red deer came crashing through the roadside forest and darted in front of me. Just a few meters closer and it would have been a wipe-out! Another few hours of dismal track followed shortly after then a smooth flat road to Los Yébenes through the wide open Castilla-La Mancha: an extensive tableland at the centre of the Iberian peninsula. By now it was day five and after passing through Toledo, Madrid was in site. Bikes were once again permitted on the A-roads but entering the capital city was horrendous with a narrow hard shoulder and lorries thundering past at over 50 miles/hour literally 1.5m from the bike. With the real threat of being flattened I diverted to Getafe to search for a quieter route. And as luck would have it I met a local cyclist who offered to take me on the newly-built 9 mile cycleway to Madrid. Later that day I posted a big thank-you to George who certainly saved my bacon. The second tree planting was in an ONCE blind school kindly organised by Juan Pagola (Viverospagola). It was also great to stay with Juan and his family. The Gingko tree planting event was very intimate and held almost in silence. Small groups of blind children were led up to the tree so they could touch its trunk, then small branches and leaves. All the time they felt so gently with their fingers, experiencing a tree close-up for the first time. Imagine these children had never seen let alone touched a tree – it was a very emotional experience to be a part of. During the quiet assisted spade backfilling there was no place for a group tree discussion. Instead I spoke quietly in Spanish to the students one on one. Both Juan and I were close to tears. Madrid to San Sebastian. Again leaving the capital was busy and horrendous. At one point had to cross over three exit-lanes with vehicles roaring past to join the main A-road leading out of the city. Heart pounding stuff. Thankfully quieter roads lead to Jadraque via a 1000m high-level plain with spectacular views of the Sierra de Guadarrama mountains. Sitting alone in the middle of nowhere with red kites circling overhead I thought “not yet you carrion feeders not yet!” By now I was doing an average of 80-100 miles/day with 9-10 hours in the saddle. On day eight descended a cloud-misted cork oak forest towards Agreda and stumbled across sheep in the road. An idyllic rural scene broken by loud barks from a huge mongrel St Bernard sheepdog. As it sprinted across the adjacent field I thought no-worries as there’s a fence. But gazelle-like the fence was vaulted and hard on my heels followed the sheepdog snarling loudly. At the last minute I looked away anticipating an ankle bite but with a bike spurt said dog gave up the chase. Phew! The road leading out of Agreda towards Pamplona was flat and open with not a tree or hedge in site. And how the north headwind blew for mile upon mile. Recall taking a petrol-station break thinking please give me a break. However, on reaching Pamplona and the start of the Basque Country (700m high) Azpiroz Mountains the wind dropped and even the steep long pedal-pumping climbs were welcomed. Arriving at Lizarza with 135 miles biked that day it was time to meet Juan Pagola once again for the San Sebastian tree planting this time organised by his colleague Juan Alvarez. 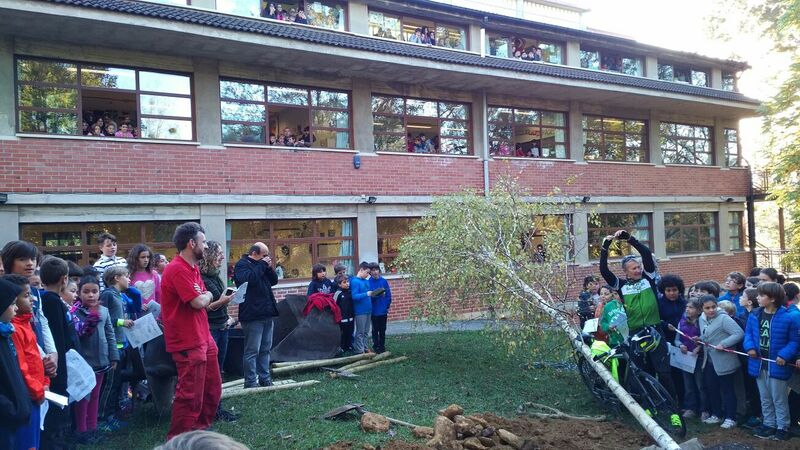 This was a huge event with over 500 children from the Ikastola de Zubieta school matched by an 8m high silver birch. Was a little intimidating as over 300 kids surrounded me with the rest glued to the overlooking windows. Many wanted to shake my hand – felt like tree royalty. Despite feeling nervous to the core I was itching to give the tree workshop in Spanish which I did but was then asked to revert back at times so the students could hear English. A rope had been placed around the prostate tree and aided by several students it was hauled up into the tree pit – to voluminous cheers! Individual students then spoke about their tree values: this was becoming tearful especially after the huge gathering sang a tree song. Choked! Approx. 700 miles biked so far. Bayonne to La Rochelle. At times Spain had been mountainous and one large huge climb on the French border remained. On the top I paused a while looking back to San Sebastian in the distance thinking Spain done! Yes. From Bayonne the coastal road to Parentis en Born – along the Bay of Biscay – was flat and flanked with mile upon mile of pine woodland. Another headwind taunted me all day. But a 120 mile ride with an on-bike nosebleed saw me arrive in this sleepy pretty French village. Ride day 12 and it was time to crack-on north to Pointe de Grave avoiding Bordeaux by taking a short boat-trip, across the Gironde estuary, to Royan. By now the focus was on the ferry from Caen (Ouistreham) and destination Kew Gardens so I cranked out a 127 mile ride to reach Saujon: just south of Rochefort. The French roads were flatter with landscapes not dissimilar to southern England and a pattern of countless small villages linked by dozens of roundabouts was emerging. Needless to say the mountainous panoramic views in Spain were now only a treasured memory. En route to La Roche-sur-Yon I passed through La Rochelle site of the first maiden dive (1864) by a mechanically powered submarine: “Plonguer”. I’d been told that France was flat but hills were now coming on a pace as I approached Nantes. Again entering the city close-quarter lorries thundered past: at times ‘elbow-to-elbow’. No place for a bike I thought but once in Nantes was impressed with the cycle network that any Dutch city would be proud of. Straight lines are always best and the plan was to head NW across country to Châteaubriant. Here was a posh hotel, one of few on the trip, and the night-lit “White” cathedral was stunning. Nantes to Ouistreham. Next day leaving the town, dense fog reduced visibility to only 4m with my trusted friends: lorries looming out of nowhere. Being alone on a bike with only small LED lights was very unsettling. And to cap it all this was the start of the Suisse Normande: a rugged region resembling (as they say) the Swiss Alps with steep gorges carved by the river Orne and its tributaries. And so it began en route to Vire, with second on-bike nosebleed, nearly 100 miles of rollercoaster hills lined-up mile after mile. I’d conquered Spain and this punishing landscape was not going to beat me. But it and I had our moments that day. Feeling battered but relieved in Vire I ate my own bodyweight with fine French food! Awoke following morning with thoughts of the ferry from Ouistreham to Portsmouth: homeward bound! The short trip to the ferry was flatter and passed through Caen with its Abbaye (abbey) aux Hommes founded by William the Conqueror in 11th century. Before the Portsmouth night crossing some quiet reflective time was spent biking along the coastline: focus of the 1944 allied Operation Overlord (D-Day) invasion of Normandy. Thankfully the Channel crossing was flat and I slept like a log. Portsmouth to Kew Gardens: Just 80 miles remained but by now I’d had it with lorries so left the busy A3 to divert through the South Downs National Park. More hills though with a few more final hours of pedal pumping and was glad to see the River Thames in Shepperton. After my last night on this epic trip and on day 19 met with Mick Boddy (fellow F4T trustee) for the final 7 miles – past the famous Twickenham rugby stadium – to Kew Gardens. Planting a Melliodendron xylocarpum in the Dukes Garden with Kew staff including Richard Barley (Director of Horticulture) and Tony Hall (Arboretum & Gardens Manager) including Matt Biggs (garden writer and broadcaster) as a proud moment. Job done! During this 1,500 mile solo unsupported F4T bike I’d had just one puncture, two on-bike nose bleeds, been chased by a snarling sheepdog and nearly wiped by a red deer, crossed mountains ranges, braved treacherous roads but was back in one-piece with determination and self-belief tested to the max. And yes, bought back a Gibraltarian ape toy (star of the Kew tree planting) as a fun gift for Tony Kirkham (fellow Arboretum & Gardens Manager). Many thanks to Juan Alvarez, Tony Hall, Jon Hammerton and Juan Pagola and especially, Linda Harris (Kew Gardens) for organising and supplying the tree plantings. With special thanks to Rachel Judge (Eezytreev) and Darren Kilby (Gristwood & Toms) for their ride sponsorship. The ride objective was to raise the profile of Donate1Job and Donate1Hour. Your industry needs you so please sign-up.